I'm a great fan of this program. And, as I've said before, just when you think FastStone Image Viewer can't get better the developers come up with another gem ... this time it supports dual instances, which allows you to run two image viewers at the same time, drag and drop images between them, and compare images from different folders side by side. Well done FastStone! I have been using FastStoned for several years and I really like it very much. It does everything I want almost intuitively, I have used other capture programs in the past but none compare to FastStoned.I use just about every day either resizing or cropping a pic so I'm glad it’s always here 4me. 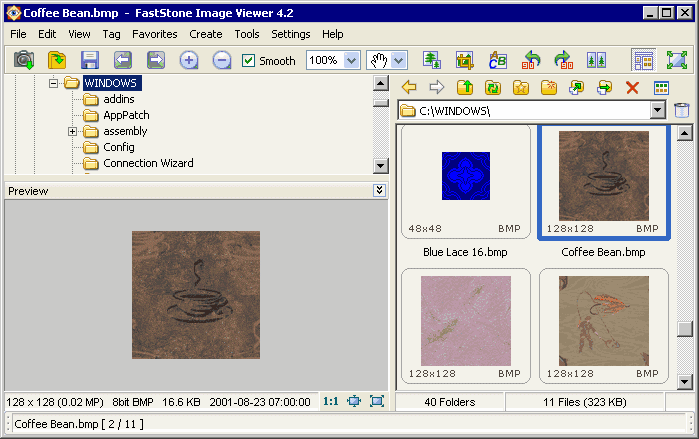 @ fullbug: This is FastStone Image Viewer. You are talking about FastStone Capture ( http://www.portablefreeware.com/index.php?id=775 ). This is the only capture program I have ever used, its the best! Decided to give this app a try, and I'm blown away by it. I love the fact that it allows basic 'digital darkroom' work on the .dng files produced by my Pentax K10D and Ricoh GX200 cameras. Previously, I could use the simple Pentax Photolab on the K10D files, but it wouldn't recognise the Ricoh ones; I had to use the (too complicated for my needs) RawTherapee (the Ricoh software was cr*p). Now I can use the same software for both. Brilliant! There always seems to be a gem in every new version of this amazing program. The new "Design and Print" (Alt+P) is no exception - very nice. Just a reminder. Faststone builds a thumbnail database (FSViewer.db) as it scans folders. This process can be a little slow the first time it scans a folder, particularly if there are lots of hi-res pics. However, the advantage is that subsequent visits to folders already scanned are very fast loading the thumbnails. The downside is that the database, which can be very large, is stored on the flash-drive (although with the size of flash-drives these days it's much less a problem than it once was). However, if you are using a small flash-drive the solution is simple: go to settings (F12) | Thumbnail tab | disable "Use thumbnail database". Loading thumbnails will be slower, but the there's no thumbnail database file clogging smaller flash-drives. Has anyone figured out the thumbnail display issue when using FSViewer in linux/wine? It only displays the first twenty or so thumbs in a folder. It sees the images but wont display the thumbs. "Fixed a bug in the "Adjust Lighting" tool that it could not save changes of Highlights"
Just found another bad bug that qualifies this as a version to avoid. It has new features, one of which is similar to the brightness editor. Any adjustments I make simply revert and do not save. Version 4.3 has a bug that I wonder if others can reproduce? Ancient: Agreed. Although I haven't had the hang issue. My favorite image browser. Essentially, ACDSee for free. The one problem is that it hangs from time to time, not really sure why. Maybe the latest 4.3 has fixed it! Excellent free download with one thing that I cannot do. Crop an image out of a photo and print a 4x6 picture of that cropped image. Small, lightweight and perfect program. Recommendation! Love it! I was using Picasa as my main organizer but hated the editing results that would change after exporting. I found this program and I put a copy of it on all my photo usb drives. It makes life easier when bringing photos to show friends and family. There is so much to this program. I'm amazed by its small foot print and its enormous power. what chris? why would you ever need that!? Nice, but where is the option to play sound files with each picture, like in Thumbs Plus? I am doing lots of photo work! This program is my default viewer for a couple of years already! Its really great, thanks a lot! Everything is so easy, even batch conversions! Amazingly FastStone Image Viewer keeps getting better and better. This is a must have program. Ok, it's really good, and etc., I also want to state this. But here's a little tip: go to Settings - settings (or hit F12), Thumbnail tab and disable "Use thumbnail database". I started to use the program and notice some space missing in my device, found this option, disabled, got 54Mb back! One of the best image viewers around continues to get better. Highly recommended. Excellent software. This program not only gives a more convenient way to zoom an image but also zooms more smoothly. I compared it using several test images with IrfanView and XnView (both latest versions and set to the smoothest zoom possible) and FSViewer was the best. I also liked the way it gave access to thumbnails in fullscreen view by moving mouse to the top of screen. The keyboard shortcuts are also good. Having said that, it cannot entirely replace IrfanView and XnView. These two programs also have their own unique features. So I am now using 3 image viewers according to my needs at the moment. As a professional and "software rebellious" photographer who prefers GIMP to PhotoShop, I'm always looking for "just do it" programs to speed workflow with reliable, excellent results. FastStone is simply the single best small program available. And the ability to export by hitting "E" and send images to the GIMP for final tweaking - is just perfect. It should get product of the year IMO. tagging), EXIF only reports technical info from cameras. Fantastic freeware! Tough choice between this and IrfanView, so I use both (the crop tool in particular is a lot better in FastStone). The Capture tool is missing the Scrolling Window option, and there's no Screen Color Picker, but those are small omissions in such a feature-packed - free - utility. I find the batch F4 and F3 tools most useful. I switched skins to one of the XP styles - much better. Now if I could save the thumbnails off like in Irfanview... FS would become my one-stop shop. Very good, I prefer it more than ACDC, the only thing poor is when you have to convert a group of pictures, I had to do one by one. I wanted to love it, truly I did. The feature set is very attractive. Unfortunately, I don't have eyes like a hawk, and the (apparently) 6-point font used for the interface and the tiny icons just made it too much struggle to use, even with 120-dpi screen setting at 1024x768. So back to IrfanView for me, which anyway supports audio and video files too. If anyone knows of a way to modify FastStone interface for a larger appearance, I'd love to try it again. The 30 day trial pay version of FSCapture allows you to set edges (torn etc.) on all sides, while this last free version allows it on 2 sides only. FSViewer goes even further and allows all the same editing, highlighting, drop shadows etc. and on top of that, you also have 88 (yes - eighty eight!) frame masks which do the whole torn edges, hearts, and other special effects on the edges, as well as rotating the screenshot to any angle you specify, and much more. I think I will be removing FSCapture from my PC and using only FSViewer from now on. Only one thing more I would like to see in FSViewer - the ability to save an image to a Windows icon .ICO file. This is one of the best image viewer/resizing and other utility programs I have ever used. Take a look at the screen capture / edit capabilities also. I just noticed that tonight. Below is what I just posted under the FastStone Capture comments. FSCapture is good, but even better, take a look at FastStone Image Viewer (v3.2 is what I have) - it has a built in screen capture which looks like it is exactly the same as FSCapture, but on steroids. (Click File, Screen Capture and then choose from all the same types that FSCapture has - Foreground Window, Window or object, Rectangle region, Freehand region, Full screen). The only thing it doesn't seem to have is the hot keys, but that is minor. I just can't believe this is free. There are just so many features, including a version of their screen capture and bulk resizer/converter utilities built in. I doubt you'd ever need another image viewer. I tried running this on Ubuntu LINUX using Wine. Haven't tried all the features yet, but am quite impressed. with ocr added and a graphic find type % approx will be maximum in the world and all will have it. This program works perfectly, incredible graphic interface, Freeware, All the option you want woth a program like of image . i had first an error-alert, that the stick is write-protected. but the after i pressed "F12" it was working fine.